Ross Welford, an English author, pens his debut middle grade science fiction story, Time Travelling with a Hamster that unfolds the story of a 12-year old boy who after his father's death travels back in time with his father's invented time machine to meet his father along with his pet hamster, but things do not go well when he go backs in time. When Al Chaudhury discovers his late dad’s time machine, he finds that going back to the 1980s requires daring and imagination. It also requires lies, theft, burglary, and setting his school on fire. All without losing his pet hamster, Alan Shearer. Albert Einstein Hawking Chaudhury was eight years old when his dad died for the very first and on his twelfth birthday he receives a letter addressed to him written by his father when he was alive. In his letter, he has passed on to his invented time machine to Al and has been asked to use it to go back in time to save the life of his father, when his father was twelve years old and an accident happened to him. But Al fails to save his father from death. And that moment changes the laws of the time-machine thus making it impossible for Al to go back in the present. Al has time-traveled back to the 80s with his pet hamster but how is he supposed to save the life of his father? The writing style of the author is articulate and easy to comprehend with. Since it's a middle grade story, the writing is apt for the young aged readers. The author has penned this story with so much thrill and it feels like riding a roller-coaster that only goes back and high up in the air as the ride is filled with adrenaline-rushing moments when the boy and his pet hamster is lurking from one time's dimension to another. The narrative is extremely fascinating and since the boy is of Indian origin, the author has done a great job in arresting the Indian linguistics along with its proper meaning into the story line. The pacing is really fast as the story grips the readers from the very first page. The concept of time-traveling has been explained very well and easily for the readers and the logics used by the author to make time-traveling possible are apt. Even young readers will find the story to be enlightening for their minds. The author has vividly captured the feel of a person who is traveling through time, and along with Al's feelings, the readers are bound to feel the same way. The characters are very, very interesting and are highly inspired from reality. The main character, Al, is a brave young boy who heeds to his father's advice and follow back in time. He is sharp-witted and extremely fearless considering his age. The author has strikingly captured the voice of an innocent 12-year old boy. The supporting characters, especially, Al's grandfather, Byron, is very well-developed. The whole story is centered around the boy and his grandfather's relationship through good times and bad times. They both had a strong bond of friendship and trust and is arrested by the author with lots of deep, heart-felt emotions. Overall, this is an enchanting and illuminating story that is laced with enough thrill and heart-stopping adventure that will not only enthrall the young kids but will also intrigue the mature readers too. Verdict: If you love time-traveling science-fiction stories, then definitely go for this one. Ross Welford worked as a business journalist before becoming a freelance writer and television producer. He lives in central London with his wife, children, dog and tropical fish. 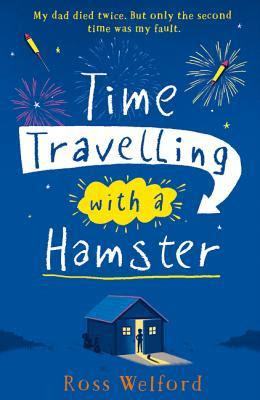 Ross is the author of Time Travelling With A Hamster, a thrilling, funny and heart-warming middle-grade novel that tells the story of a boy’s quest to live up to his dad’s memory, published by HarperCollins Children’s Books. Fab review. This is one I intended to read but just didn't get around to it.